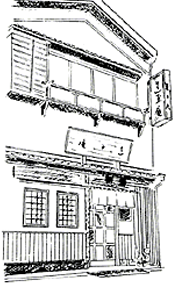 Situated near Ueno Park, Rengyokuan soba or buckwheat noodle shop has been in operation for over 140 years since the end of the Edo Period. Numerous old manuscripts from the Meiji Period on record how intellectuals and men of culture would stop at Rengyokuan when they visited Ueno Park and surrounding area, which includes a variety of galleries, museums, a zoo, institutes of learning and many other cultural institutions where one can steep oneself in culture. For our soba noodles we select only the finest buckwheat from all over Japan and use our own special techniques for preparation. We devote ourselves each and every day to satisfying the customers who visit our shop. Today buckwheat enjoys popularity as a health food, but in fact buckwheat has been a food in Japan since ancient times, and soba noodles served seiro style is a dish unique to Japan, and something you should definitely try. So by all means, please give us a visit!